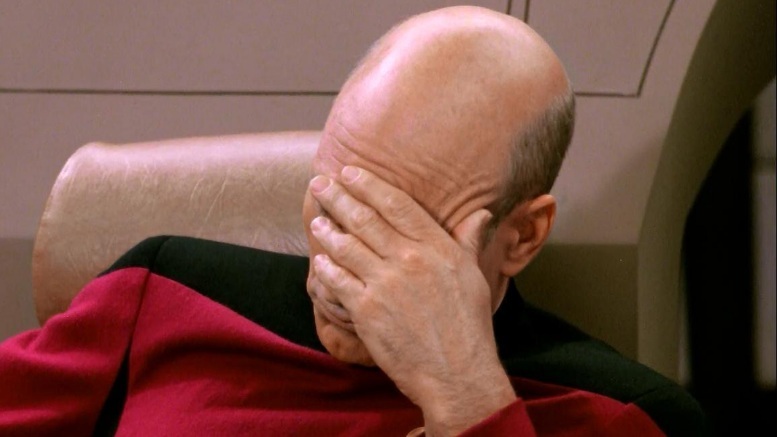 As noted by KnowYourMeme the Picard facepalm is one of the most popular memes on the web. The fateful moment that launched a million gifs is from the Star Trek: The Next Generation episode “Deja Q” when Q becomes a mortal. Watch it below. The ThinkGeek mousepad actually isn’t the first bit of merchandising featuring the famed Picard facepalm. Below are are few other ways you can add a little facepalm to your life. The folks at Ata-Boy have a nice 4″ sticker featuring the Picard facepalm. The kids love this one, and you can pick one up at Amazon for just $3.75. The official Star Trek shop features a facepalm T-shirt in various sizes for $24.95. We Love Fine has a variation on the facepalm with their “EmotiPicard” Tee with the facepalm and more classic Picard moments. Available in various colors and sizes for $25.00. There are many unlicensed facepalm tees floating around the web, but one of the more creative ones is this Ascii Text Facepalm Tee from Threadsquad for $19.99 in various sizes. Some unlicensed products are worth sharing when they provide a bit of creativity and flair, such as this facepalm shower curtain from Society6.com. And Pinznthingz.com lets you class up your work atire with this Picard tie tack. And finally, if you want to both express your frustration and have a good snack, why not eat some facepalm cookies made with the things4thinkers facepalm cookie cutter. So that gives you plenty of ways to share your frustration with Captain Picard, next time someone makes you just want to put your face into your plam. Wait .. People still use mouse pads? Face palm shower curtain? Is my arse really that fat??? LOL it is so funny how this one scene has become so famous its still used everywhere today. I love Picard! Where’s Facepalm – The Flamethrower?? Face palm the toilet paper!